A dead newborn dolphin floated in the display tank at West Edmonton Mall on Friday, being nudged gently by its grieving mother in full view of hundreds of saddened shoppers. Parents trying to escape the summer heat in the air-conditioned mall came face-to-face with their children's poignant questions about life and death. "Why is it not waking up?" one young boy cried to his father. "Is it hungry?" 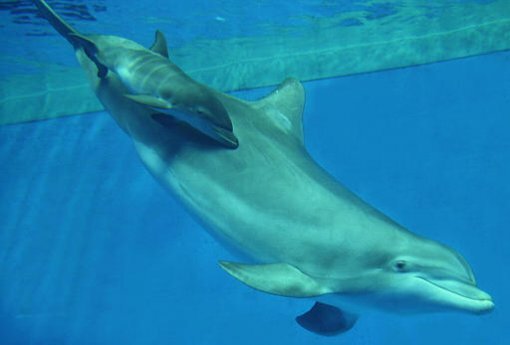 The calf was born Thursday to Mavis, one of the mall's two Atlantic bottlenose dolphins. It died shortly after birth. An autopsy will be performed to determine cause of death. Trainers left the dead calf in the tank with Mavis and its father, Howard, to give them a chance to grieve. Members of the mall's dolphin care team cannot safely enter the pool until Mavis has accepted the loss, mall spokesman Travis Reynolds said. He said Mavis had enjoyed a healthy 12-month pregnancy without complications. She will now be monitored to ensure that she is well and quickly regains her strength and energy. "This was a much anticipated birth, and it's a devastating loss to all of us," Reynolds said. Tove Reece, president of the Edmonton-based animal rights group Voice for Animals, called the death another example of why dolphins don't belong in shopping malls. "It's Mavis's third baby, and they all have died," Reece said. There is no doubt that captivity shortens the lifespan of adult dolphins and is not a healthy place to give birth. "I don't know why this baby died, but it seems to be a recurring phenomenon. It can only point to the fact that there is a problem. Dolphins aren't meant to be kept in a small concrete tank." The Edmonton SPCA has received numerous calls of concern about the calf. But Melissa Boisvert, spokeswoman for the animal protection agency, said the decision to allow the calf to remain in the tank was the right one. "We believe the dolphins' care was not a factor in the death of the calf... and we agree that the mother should have time to grieve." Special constables from the Edmonton SPCA had conducted a routine inspection two days prior to the birth and determined that the tank exceeds recommended space requirements and there were no signs of abuse or neglect. On Friday afternoon, Mavis repeatedly pushed the baby around the tank, sometimes taking it towards the bottom, then nudging it up towards the surface. She would leave the body alone for minutes at a time, then come back to it. One concerned trainer crouched by the side of the tank, watching the mother carefully. Shopper Rayline Ziegler tried to explain the latest death to her three-year-old daughter Victoria. "She thinks the baby is just swimming," said Ziegler, who is eight months pregnant. Seven-year-old Ben Kurtz, visiting with his family from Beeton, Ont., studied the baby dolphin for a few minutes but didn't know what to make of it. "It might be dead, but I really think it's just sick," he said. His mother Carolyn said she didn't quite know how to tell Ben and his sister Larissa, four, that the baby dolphin was dead. "I said to them I'm not sure whether it's alive or dead, because I'm really not sure that I want to explain this to them." She said the incident underscored her own discomfort with dolphins being held in captivity. "This is a very small aquarium and that's not where they're meant to be. If this dolphin had been born out in the wild, I doubt that this death would have occurred." Dave Crowe, a shopper from Fort Saskatchewan, said he would have preferred the mall took the dead calf out of the view of the public. "Look at these kids asking why hasn't it woken up?" Crowe said. "It should be taken out of here, because all these kiddies are seeing all this." But another shopper, Bruce Macovichuk, said leaving the dead calf in the tank seemed the right thing to do. "Mall patrons may be somewhat saddened by it, but it seems a reasonable approach to take for the animal," Macovichuk added. "The risk is that there could be mounting criticism of these animals being kept here." Thursday's death marked the fifth such incident in the mall's history. Three dolphin calves born in 1992, 1993 and 1996 died soon after birth; another in 1996 was stillborn. Three were born to Mavis and two to Maria, who died in 2000 at age 19. Another adult dolphin, Gary, died at age 20 in 2001.